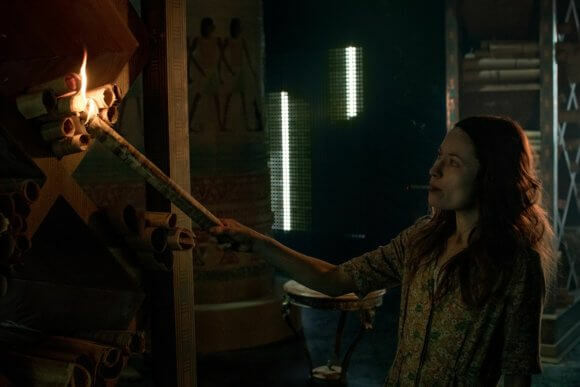 Season two episode two of Starz’s American Gods ended with Laura Moon preparing to free Shadow who’s been kidnapped and held on board a train by Mr. Town. Episode three begins immediately after the train slams into Wednesday’s car which he carefully placed across its tracks. The wreckage is spread out and parts of the train are on fire. Laura’s landed on the ground outside the train car, a few limbs ripped off and momentarily helpless. Wednesday (Ian McShane) instructs Mad Sweeney (Pablo Schreiber) to pick her up and place her in the car’s trunk. Laura (Emily Browning), quietly raging, implores him not to follow Wednesday’s orders. “I trusted you,” she says to the leprechaun, who whispers that he’s actually helping her. Mad Sweeney climbs into the passenger seat, questioning Wednesday’s decision to leave Shadow Moon behind. “The quickest way for Shadow to get where he’s going is sometimes the longest,” explains Wednesday, cryptically. Shadow (Ricky Whittle) emerges from the wreckage after Wednesday’s driven away. He limps through the forest, stumbling his way to what looks like an old well. One of Wednesday’s ravens, Muninn, caws nearby, and Shadow has a one-sided conversation with it before passing out. The raven reports in, letting Wednesday know he’s found Shadow. Laura’s laid out on a nearby autopsy table while Mr. Ibis (Demore Barnes) weighs her separated body parts. Mad Sweeney gives her a slap and calls her a degrading name, and Laura sends him flying across the room in response. Laura wonders how much longer until she’s no longer fixable, becoming grossed out as Mr. Ibis takes a piece or two of her flesh as an afternoon treat. Wednesday announces that as soon as she’s fixed up, they’re off to see Argus Panoptes. Wednesday claims Argus can stop Laura from rotting, but Mad Sweeney tries to convince Laura he’s lying. Mad Sweeney’s going to New Orleans and insists “Dead Wife,” as he loves to call Laura, needs to go with him to see the Baron. It’s the only way she’ll be saved from rotting away. Laura chooses to hit the road with Wednesday after he reminds her Shadow works from him. Speaking of Shadow, he makes his way to a store where he charms the clerk, apologizing for his appearance. He compliments the clerk’s smile as he works a con to cheat her out of a few bucks while purchasing water and a map. A stranger walks in, immediately assesses what Shadow’s doing, and gets her own car filled up with the $20 Shadow just conned from the clerk. Touché! Shadow asks the stranger for a ride to Cairo, explaining he was hiking and slipped on a rock. She knows he’s lying and snaps a Polaroid for evidence – just in case he’s a psycho. Back at his funeral parlor Mr. Ibis is telling the story of Argus to his cat. Hera, goddess of marriage and childbirth, turned Io into a cow to keep her away from Hera’s philandering husband, Zeus. Hera set Argus to guard the cow, however, Zeus had Argus killed. Hera brought him back to life in America as the god of surveillance. As his worshippers deserted him, only his memories remain. It’s likely he’ll be joining the New Gods in this upcoming war. Over at the Black Briar Golf Club, Mr. World (Crispin Glover) is told Shadow’s on the move into Illinois. One of the drones tracking him went out, thanks to a raven, and Argus’ system hasn’t been updated and the GPS logs are corrupted. Technical Boy (Bruce Langley) explains he told Argus to upgrade but Argus never did. Mr. World demands Technical Boy get “his man” in line now because gods who haven’t yet decided who to side with will view this as Mr. World not having his house in order. As Technical Boy and Mr. World are arguing, New Media (Kahyun Kim) materializes from the giant screen. She’s ready to take on the mission to speak with Argus. Meanwhile, Wednesday and Laura arrive at Argus’ massive building. Climbing the stairs, they arrive in a field next to dead version of Argus. Wednesday explains it’s a cast-off version of Argus who’s transformed into something new. Wednesday wonders what Laura hopes for the future with Shadow, and she reveals she always knows where he is because of his golden beam of light. Plus, he made her dead heart beat with a kiss. Wednesday doesn’t think Laura can compete with what he can show Shadow. He then proceeds to slit a cow’s throat, but not before thanking it for this gift. Immediately the cow transforms into Io who falls to the ground, dead and soaked in blood. “Change requires sacrifice,” says Wednesday. He removes a thin blade and as they walk back inside, Io’s still dead but her white robe is no longer bloody. Mad Sweeney guzzles alcohol and tries to find a car to steal. He finally locates one, complete with a dog in the backseat. A fight, which we don’t see, breaks out. Mad Sweeney drives his stolen car to a dock where he does a fantastic job of getting himself into another difficult situation. He attempts to steal a pontoon boat but when the ignition doesn’t start, he pulls the cord on the engine which results in it falling off the back of the boat. The world’s unluckiest leprechaun then discovers the fuel line is pulled apart, spraying gas over the deck. He slips, drops his cigarette, and sets the boat on fire. Next, he’s stumbling down the center of a road when a bus almost wipes him out. It pulls over as he falls to the ground, and one of the passengers asks if he’s all right. He’s welcomed on board the bus by what’s apparently a Christian band heading to New Orleans to perform. Mad Sweeney rolls his eyes as one of the band members asks him if he’s accepted Jesus as his lord and savior. Catching up with The Jinn (Mousa Kraish) and Salim (Omid Abtahi), we find them tooling down the road listening to music. They arrive at the Corn Palace which doesn’t look how Salim expected. Inside, strippers entertain the mostly male crowd. The Jinn explains Iktomi (Julian Richings) is a shapeshifter and a spider who can control humans like puppets. It turns out Iktomi is farming pot at the back of the Corn Palace. He turns over Gungnir but wants to know why Odin needs this instrument of death. The Jinn makes sure he realizes it’s none of his business. Iktomi also wraps up a tiny plant to be given to Odin. Meanwhile, Wednesday and Laura enter the building’s library – or the memory of a library. There’s another dead body and Laura figures out they’re following the dead body trail until they get to the most recent version of Argus. Wednesday compliments her on being smart, conceding he knows what Shadow sees in her. He then reveals their only way out is through sacrifice. Wednesday wants Laura to admit she doesn’t want Shadow, she just wants to feel again. He also believes Shadow’s frightened of this version of Laura Moon. The building’s library is a memory of the Great Library of Alexandria which contained a copy of every book ever written. Wednesday recalls the story of Julius Caesar laying siege to the city and when he was trapped, he set his own men and ships on fire. The fire also destroyed the Great Library. Laura, catching on, uses one of her matches to light this memory of that library on fire. Technical Boy and New Media discuss their plan of attack as they also arrive at Argus, and Tech Boy says he’s in charge. New Media seems fine with that, even though having two of them on the hunt for Argus is redundant. She then confesses she needs bandwidth and asks if he can hook her up. Wednesday hands Laura the blade he took from Priestess Io, demanding she kill Argus. Argus plays both sides and Wednesday needs to remove him from the equation. If she stabs him in the tattoo on his neck, Argus will die and her coin will recharge. Laura doesn’t believe him and asks to go home. Unfortunately, that means they still need a sacrifice to get out of this place. Wednesday confesses he’s been pulling her strings all along. She’s his puppet. New Media and Argus have an orgasmic merge, with Technical Boy only able to stand back and watch in dismay. He spots Laura and is about to warn New Media but instead allows Laura to walk forward and stab Argus in the tattoo. New Media’s jerked away, unhappy she wasn’t finished merging. Technical Boy tells Laura to give Wednesday a message. “Tell the old c**t he’s f**king welcome.” Tech Boy and New Media leave and Wednesday finally comes out of hiding. He apologizes to Argus, telling him it’s nothing personal. He also warns him to remember which side he’s on when he comes back. As Argus dies, Laura’s chest lights up. She’s looking alive again but Wednesday explains her old self doesn’t exist anymore. She’s not Shadow’s Laura anymore. He leaves, refusing to take her with him. Shadow’s off on his own road trip, this time with Sam Blackcrow (Devery Jacobs), the stranger from the convenience store/gas station. After a brief conversation and a cursory look at her buffalo head tattoo, he asks if she’s human. She doesn’t seem shocked by the question and admits she believes she has a gift from the creator. She describes herself as having two spirits in one body. They make a pit stop at the Cats & Dogs roadside diner and she asks why he’s heading to Cairo. He says he has to find the Egyptians, and she thinks she might know a place. Back on the road, Sam shows him another photo she took of him sleeping while she was driving. On it she’s written “Blackcrow meets Sleeping Beauty.” He chuckles and then admits a lot of his dreams are nightmares with buffalo skulls and other weird stuff. Later that night they arrive in Cairo and she drops him off by Egyptian statues. Fireflies circle him and then fly off as she asks, “Friends of yours?” Shadow’s still walking with a small limp as he makes his way toward Mr. Ibis’ funeral home. He spots Wednesday’s car in the driveway and sees Wednesday outside. Shadow demands the answers to a few key questions, but Wednesday tells him revelations come when ready – not when requested. Shadow gives in but wants to know why the New Gods are after him. Wednesday doesn’t give him a straight answer and instead tells him if he doesn’t wake up in the morning feeling like a million dollars, he can leave.